by Tabitha Holland, Signature Equine, Morris, Okla. It all began with a Facebook post that was shared throughout the mule community. "Anyone know where I could borrow a nice riding maybe reining mule for something at the NRHA (National Reining Horse Association) Futurity?" asked Jessicah Keller. Jessicah Keller along with her mom Tammye Hutton, sister Sarah Locker and David Hutton operate Hilldale Farm in Brashear, Texas. Hilldale Farm is one of the premiere breeders of reining horses in the industry. They stood the infamous Equi-Stat Elite $3 Million Reining Sire, Nu Chex To Cash. Now, they offer services of their home bred stallions, Gunner On Ice, Sparkling Major, Rowdy Yankee and Heavy Duty Chex. Heavy Duty Chex and EquiStat Elite $1 Million Rider Casey Deary competed on the 2018 United States Reining Team representing their country in the Fédération Equestre Internationale (FEI) World Equestrian Games (WEG) in September. 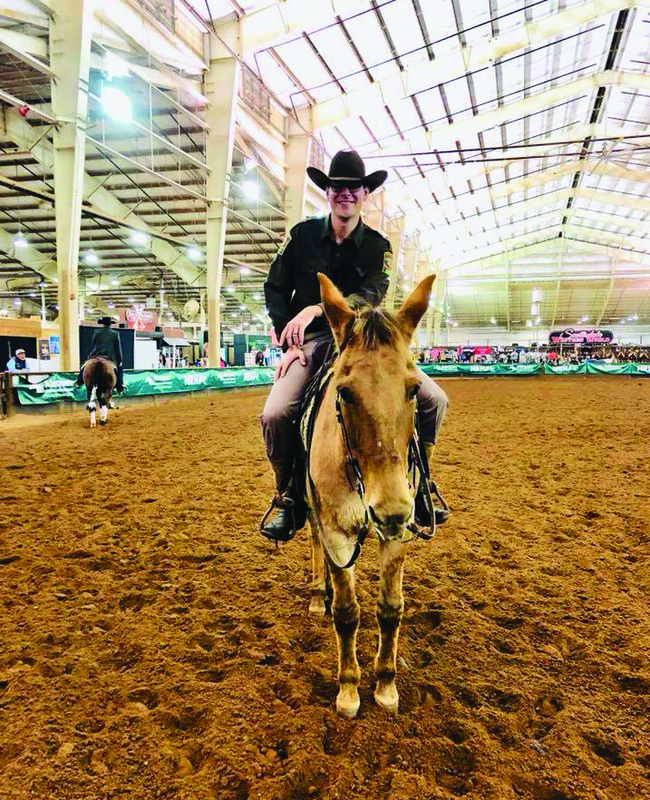 Although Keller has made a name for herself competing on the highest quality of horses in the reining pen, she is no stranger to mules and has always had a soft spot for them. Jessicah competed in the all-around events on her mule. As she got into reining horses, she used Miss Cody in a couple of her freestyle routines back in 2002 including a “Beer Run” number with Nu Chex To Cash. Miss Cody has since retired but when Keller was invited to enter this year's $20,000 Invitational Freestyle Reining at the NRHA Futurity, she knew she needed something special. The NRHA Futurity is the largest reining show in the world. The very best reining horses and competitors from more than 12 different countries come to Oklahoma City to compete for an estimated total purse and cash prizes of more than $2 million. Freestyle reining unites the finesse and precision of reining with music, costumes, props, and theatrics. The combination creates some of the most entertaining performances a horse enthusiast could hope to see! Keller was competing at this year’s futurity in the non-pro division on her 2010 bay mare, Snip O Satellite. Snip O Satellite is the 2018 World Champion Intermediate Non-Pro Horse and has won over $50,000 to date. Keller had an idea, but needed a mule to complete her vision. She drafted a post on Facebook and received a private message from mule professional Tabitha Holland of Signature Equine. Keller explained her idea to Holland and they talked about the different mules Holland had available. They settled on a 12-year-old john mule, Dun It With A Twist. Because of Anderson’s extensive background in reining, he worked with Twist on quiet spins each direction and developing his stops. With Twist’s kind demeanor and now a little background in reining, he was the perfect choice to represent long ears at the biggest reining show in the world. Holland hauled Twist to the show the day before the performance so Keller and her trainer could practice. The final piece of the puzzle was trainer Trent Harvey. Harvey trains in Marietta, Okla. He has a background in cutting horses and moved to reiners more recently. He was assistant trainer to NRHA Professionals Casey Deary and Jordan Larson before making the move to his own operation. Earlier this year, Harvey piloted SM Steppin Junior to the Reserve title in the L3 Open NRHA Derby. Although Harvey had never ridden a mule, he was up for the challenge. “That was the first time I rode a mule and I actually lunged him because I had no idea how a mule would act,” stated Harvey. Keller and Snippy completed spins and stops and were joined in the arena by a golf cart pulling their bootlegged wagon full of beer in true Bandit style. Then, the Smokey, played by Harvey and Twist, galloped into the arena and the chase was on! “The crowd reaction was really good when I came into the arena,” said Harvey, grinning. When the placings were announced, Keller’s Smokey and the Bandit routine earned them a score of 224 which was good enough for third place and a nice check. Twist was in the arena for all of the award ceremony and many competitors and audience members got photos taken with the only mule at the futurity. Following the results, Keller, Harvey and Holland were interviewed by RFD’s Jenifer Reynolds, host of “Horse of the West.” She stated that Twist would be the first mule to ever appear on their program. The entire performance was broadcast live on the NRHA website and the mule touched quite a large audience at this premiere event. Keller says she hopes to work with Holland and her mules again to create another memorable freestyle routine.